Shopping for Novelties Lunch Boxes? Hey, what's for lunch? Maybe it's bacon! 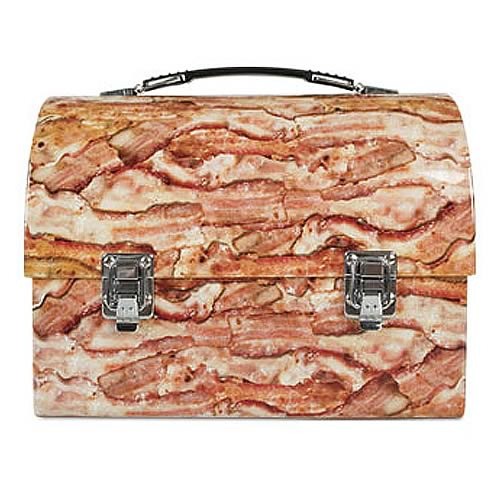 This super-slick, classic domed lunchbox is entirely covered with images of gloriously greasy strips of fried bacon. But it isn't oily on the inside! Each 9-inch x 6 3/4-inch x 4 1/4-inch metal container has sturdy metal fixtures and a plastic handle, and is boxed with an information sticker. Warning: May cause uncontrollable drooling or draw dirty looks from your vegan pals!